Wow. Seriously. WOW!!! Based on the early reactions, the fact that Rogue One is trending, and the euphoric state I find myself in, people are ebullient. How could you not be? The news that we were getting a teaser trailer yesterday reverberated across the web. Just that image alone of that mystery trooper kept so many of us on the blissful edge of anticipatory chaos. What were we going to see? Will the main villain be confirmed? And just who would Felicity Jones’ character be? Spoiler Warning! If you have not seen the trailer, and want to avoid spoilers from the teaser trailer, do not read ahead. You have been warned, which sounds absurdly ominous. Naturally, as the trailer was presented on Good Morning America, so many of us were glued to the screen. Almost instantaneously, StarWars.com posted it, and here we are! It was a sizaeable trailer too; The Force Awakens original teaser contained no story detail, but featured the main characters, and was much shorter. The Rogue One teaser gives us a clear picture of what the vision and tone of this movie are, and it is electric. Perhaps the thing that surprises me the most is how caffeinated I feel after watching it. I knew it was a new Star Wars movie, it would be an event, it would be exciting, yada yada yada. Of course that would be the case. But my expectations were much more reeled in for Rogue One, as opposed to the voracious hype I was consumed by in anticipation of The Force Awakens. But, what would Rogue One be about? It has been made clear that this film would reveal how the Rebellion stole the plans to the Death Star. However, there had been no specifics, which was fine with me. Lucasfilm has put on a master class in creating an anticipatory environment, and it is clearly working. On to the trailer! Jyn Erso, the character played by Felicity Jones. She looks like a force to reckoned with, and the clips we get offer a glimpse into her personality and fighting prowess. Plus, she has already given us an instant Star Wars classic when she mentions her stance on what it means to be a part of a rebellion. I won’t spoil it here, but if you’ve seen it, you know exactly what I mean. The tone of the film. It appears the filmmakers have captured the feel of the original Star Wars when we get a glimpse of what appears to be Yavin IV, the moon we know so well from A New Hope. It’s also much more grisly and messy than what we are used to. It’s raw, savage, and truly feels warlike. It reminds me of the tone of The Hunger Games series, but with the promise of hope sprinkled in. The returning elements of the Star Wars franchise are all over this teaser. Mon Mothma, AT-AT’s, the Emperor’s Royal Guards, and much more are highlighted, truly returning us to the Original Trilogy decade, but with a modern feel. The actual construction of the Death Star, with that powerful shot of the dish being put on; the proverbial icing on the cake for the Empire. With that, and the image of the Star Destroyer, I was enraptured. I feared I was going to suffer from Death Star malaise, but my fears have been assuaged. This is my favorite shot from the teaser. The music: this is the first Star Wars film without the maestro, John Williams, and while this is unfortunate, it appears that Alexandre Desplat is up to the task at hand. The piano chords featured at the beginning and end of this are beautiful, haunting, and feature a restrained power. I always look forward to new Star Wars soundtracks, but this one is going to be extra special. The new Stormtrooper armor (at least that is what it appears to be). This image was featured yesterday on the teaser to the teaser, and began to launch the Star Wars hype train anew. As has been well documented already, there are capes aplenty for us to savor. Star Wars has a marvelous tradition of capes, and it continues here. Whoever this new antagonist is, they look serious and capable, especially in the strut across the battlefield. Plus, there is someone with a black cape, bowing in a chamber surrounded by the Emperor’s Royal Guards. Hmm. 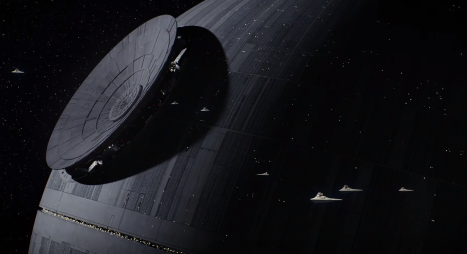 The new Rogue One teaser trailer is a tantalizing look into what we can expect this December, and begins the speculation, theories, and excitement yet again for what is to come. I believe that for me, the trailer hit me much harder than I expected. I’ve always looked forward to this film, but I’m usually so ensconced in the episodic Skywalker adventures that I think I subconsciously believed this would be Star Wars filler. I presumed it would be another blockbuster, popcorn flick. I am happy to say that I was blissfully wrong. I’m Star Wars level excited now, which is great for me, challenging for my wallet, and meaningful to so many of us who love this franchise so passionately. The hype for Rogue One has officially begun. I can not wait to see where it takes us. Let me know your initial impressions in the comment section. MTFBWY! Previous article ROGUE ONE: A STAR WARS STORY Official Teaser Trailer is Here! I wonder if that was Desplat’s music in the trailer? After all, TFA’s wasn’t John Williams. I thought the music sounded excellent, either way. I love Desplat, so I know he’ll do right by Star Wars. TFA was scored by John Williams. I am in the middle with this trailer. It looked neat but it didn’t really have the Star Wars feel. At least that is my perspective. Oh, I know that. 😉 The trailer music for TFA wasn’t by Williams, though. Well duh. 😉 I meant the musical cues we are so familiar with. Well said. I think you captured what I was feeling without even knowing it. Let me just say……….I LOVED this trailer!!! How can you not?? Now I can’t wait for it to hit theaters! Hurry up December 16th!! For a story within a story (which this is if you think about it! ), it’s going to be a fun ride! I don’t know about anyone else, but I have always wanted to know exactly what went down when the Rebellion sent people to check out the Death Star and retrieve the plans so it can be destroyed. Mon Mothma knew that whatever this weapon was it was something that was not going to be good for the budding Rebellion.